Halloween freebies and lots of other updates! I'm a little sad that Halloween is already over, but that's ok because Thanksgiving is right around the corner! I finally finished my huge Thanksgiving Literacy Pack that I have been working on for awhile. My students always seem more engaged when my literacy centers and writing activities go with the theme of the month. I'll be posting it later this week, once I get some classroom pics of it! But before we get in to that..
Look at all of my new books! We have been tracking our math assessment averages on the classroom wall. You can already see what units will need more work (addition and subtraction strategies... those missing addends are so abstract for my little firsties). But I am excited to see some growth over the next few units. How do you track data in your classroom? I would love to hear about some other ways it can be done! Ok enough about the data... time to get to the fun stuff! Halloween is my favorite holiday and I am so sad the week is already over. In math we measured ourselves in non-standard pumpkin units. It's a freebie!! Surprisingly, most of my students were 10 pumpkins tall! Earlier in the week we did some candy corn addition and subtraction. In science we did pumpkin investigations! Always tons of fun! I used a freebie from Bunting, Books, and Bainbridge. My students LOVED it! Everyone should check it out! We made predictions of whether the pumpkin would sink or float. And we estimated and counted the seeds by grouping them in tens! I had some interesting guesses.... many in the 100,000s... Guess I know what we need to work on this year! 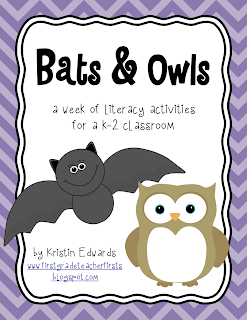 In reading, we completed our owl activities from my Bats and Owls Week Unit. I usually do bats and owls in the same week, but we just had so much going on. And on Friday we had another mystery reader! My kids look forward to this all week!